You are here: Home / language learning / Hungarian intermediate lesson: What does this letter say? This word is also seen in the word lim-lom = odds and ends. The extra information after lom illustrates how you can add meanings to Hungarian through consecutive endings. Linguists call this a feature of an agglutinative language. Wow! Hungarian can be pretty crazy. Now a few words about the curious lomtalanítás: once a year Hungarians can throw out stuff from their attics, basements, closets, etc. 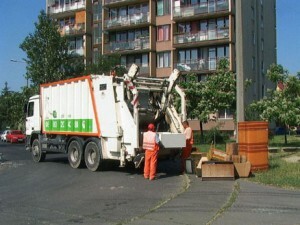 to a specific place on the street, and the municipality will come by and take it away for free. They notify you of this possibility through a letter like the one we got above. Though of course you can also have your junk removed during other parts of the year if you pay someone. 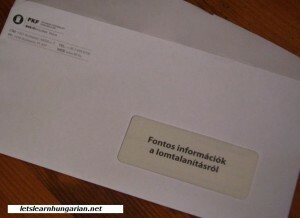 This is why you can often see signs around Budapest and elsewhere advertising “lomtalanítás” as part of their services. *Please note that we don’t provide a very detailed explanation of grammar in these short posts. For a more detailed explanation of grammar, I highly recommend a book like Hungarian Verbs & Essentials of Grammar 2nd ed. by Miklós Törkenczy. Readers: what do you think of this series? Can you recommend anything else you’d like to see in this blog? Let us know in the comments, thanks!